Hi, I’m new here but have always read things in here without being a member. 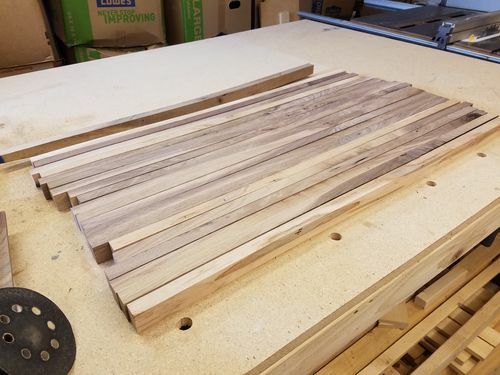 My question is that I’m making a large table top face glued, do I need to joint each piece then run through the planer or can I just rip the pieces and run them through the planer on each side so there smooth? I ran each individual piece through my jointer then ran them on opposite side through the planer but I just feel like I’m waiting so much material? The last one I did I jointed and plane the board as a whole and then ripped the pieces down to size but after I ripped it the wood then relieved stress and were no longer straight. I think I understand – just a typical edge grain joint to end up with a face grain table top. Depends on what shape the lumber is in. Get 1 side straight, Rip all pieces to the width you want from a board. If rough cut you might plane a bit to clean it up. Joint the edges, glue it up. Yep, many times the boards dont come out straight, thats part of ww. The jointed edges need ti fit. I prefer a bit if a spring joint, slight gap in the middle – the ends wont spread apart later on. Let it sit a few days un clamped, i like to stand them on end. Hope you have cauls for the glue up. Plane the top flat. Dress the bottom as well as you want. Work both top and bottom together until the bottom is as clean as you want. You did not say how you plan to flatten the glued panel. Hey thanks for the reply! So I am actually gluing the faces together and having the edge/side grain as the top. But you did answer that for me thanks, wish I would have asked this before I wasted all that good wood! Non the less, you live and learn! Also, it’s like a butcher block top I guess but not a butcher block if that makes sense. There 1.5” ×1” pieces all glued up on there sides to make a coffee table top. Ok, rip all the boards and then plane the faces – you want them flat. I would stagger feed all boards through the planer at the same setting, starting with just kissing the high spots. You want the edges of the flat sawn side flat with no gaps when placed together. You dont need the middle of the boards making 100% contact. As for curved boards from stress relief – you will have to be the judge. Dont try to straighten much through clamping – it just builds in stress. Jointing them fairly straight is best. If the face of the boards have a long curve over their length it should not be an issue, just glue and clamp. Ok that makes more sense and is what I will do on the next one, thanks a lot for your help I really appreciate it.